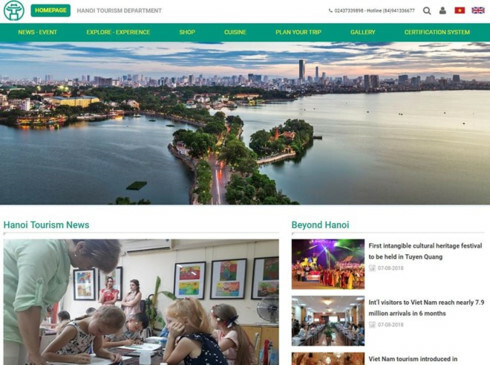 The Hanoi Department of Tourism has debuted a new bilingual portal where tourists can find all the information they need for a trip to the Vietnamese capital. Earlier, a US$2 million deal between Hanoi and the US television network CNN from 2017 – 2018 has spurred international tourist arrivals to the capital city. TV commercials aired by CNN have been introducing the best of the 1,000-year-old capital to people around the world since early 2017. In the first half of 2018, the capital received more than 3 million foreign arrivals, including more than 2.2 million accommodated tourists, up 26% and 27%, respectively, year-on-year. Foreign visitors came from 190 countries and territories worldwide. Overall, in January-June, tourist arrivals to the city topped 13.19 million, up 10% against 2017, pushing up revenue by 9.3% annually to VND39.2 trillion (US$1.74 billion). Thi city has been well-received by overseas travel firms and magazines. The online marketplace and hospitality service Airbnb named it among the world’s top 10 intriguing travel destinations in 2018 while Hanoi was listed among the the world’s top 13 destinations for international travellers in March based on a poll by readers of the US-based Business Insider magazine. Hanoi’s Old Quarter is a good place for visitors to spend time roaming around, experiencing open-air eateries and hearing the noise of whizzing motorbikes, Business Insider said. Hoan Kiem Lake provides a peaceful respite from the frenzy, as do numerous Buddhist temples and pagodas, it added.